30 Degrees will take the tough out of anyone! I had a short ride this morning as I had to catch the 6 am train to Boston which is normally kinda’ nice. It’s just under mile and a pretty flat ride and as long as the wind isn’t bad I can peddle easy to enjoy the time. Today, not so much! I’m really glad I caught the weather and checked the temp before I left but the first sub-freezing ride is always the hardest. It’s the first cut of real winter and we all know it’s the deepest. I thought I was prepared with all the proper equipment. I had a full head and face cover, goggles, good gloves, a few layers and winter coat but somehow halfway thru the cold got to me. On these mornings when it’s so dark and you are all bundled up, the first few minutes are down right cozy. But that only lasts so long before the cold starts to work on you. 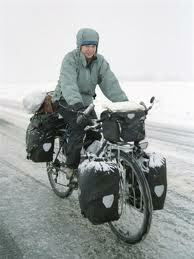 It’s the rest of the ride that the cold finds and targets all those small weak areas in you outfit. A single layer, a bad pair of sox or as I learned today an open fly will be relentlessly attacked by the cold. It’s a weird type of cold that skips all the preliminary steps. 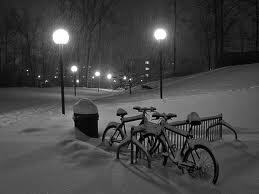 There isn’t the obligatory chill, then shiver, getting cold and finally very cold feelings. Not this cold. There is shock(because my fly was down) and awe. You go from cozy to in pain almost instantly and all you can do is hope that you will regain feeling in your feet(among other exposed parts) quick enough to have a normal morning. At least tomorrow it’s supposed to be a few degrees warmer…..and raining! A whole different battle for that one. This entry was posted in Bike commute, Car Free, Urban Bike and tagged Bike-Friendly, Boston, CarFreeBrad.com, Clark University, Commuter rail, Freezing, Glove, My Bike, Recreation, Snow, United States. Bookmark the permalink.